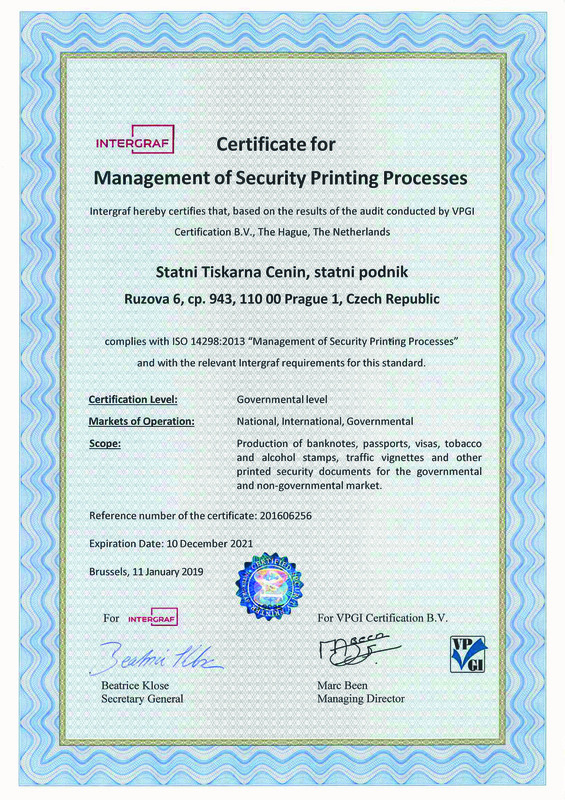 STATE PRINTING WORKS OF SECURITIES, state enterprise, after undergoing demanding preparation and a strict certification audit in January 2019 by the Dutch firm VPGI Certification B.V., became a holder of ISO 14298:2013 – Management of security printing processes. The implementation of ISO 14298 has had a significant impact on the operation of the STATE PRINTING WORKS OF SECURITIES, state enterprise, and required extensive structural modifications and the installation of a new security system in all three manufacturing plants. The certificate, whose requirements are stipulated by the company INTEGRAF, is a guarantee that SPWS takes the security of the entire production chain seriously and confirms the long-term trend in SPWS toward greater security in the manufacture of securities and documents. SPWS is currently the only printing works in the Czech Republic that holds this certificate. State Printing Works of Securities is therefore one of the world leaders in this industry.